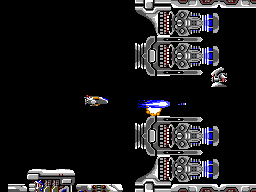 Well, it’s time to talk about the most famous and recognized SMS Shoot´em up there is, R-TYPE, released in 1988. This game was one of the first to show the true power of the SMS, and it’s a damn shame that only Power Strike I and II were able to surpass this one from a technical point of view. This is my favourite SMS Shoot´em up, I’ve played it countless times and only reached the end of it two times without using dirty tactics (like invincibility). The containers in the sixth level and Bydo in the last level were always too much for me. I was used to play top scrolling shoot´em up´s in my spectrum like 1942. 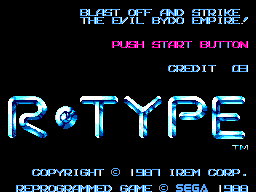 R-Type made part of a genre that was new to me, and I have to say I love it, side-scrolling all the way baby. In the SMS, only Aerial Assault and Sagaia followed this genre. 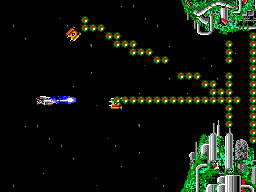 Unlike a number of shooters, R-Type was not only difficult and playable but had also variety in its levels. For instance, in level three the Boss was the level (a gigantic mothership), in the fourth level the main problem was opening way through thousands of little obstacles that paved the entire level, and in the sixth level you had to destroy the containers of death. Each level was very different and the weapons you should use and power up´s to catch were fundamental to be successful. No more catch all power-ups that do the same thing in all the levels!!! The graphics are superb, highly detailed and not far from the arcade (well, it should be stated that when we have more than six enemies in the screen the flickery appear), there are no slowdowns and all levels having a different design. The Final Bosses are also excellent, my favourites are the Krell (1st Lv. ), the Megabattleship (3rd Lv. ), the Kraken (5th Lv.) and Bydo (8th Lv.). The sound in this game is good; which for the SMS is rare. The Music is also superb and almost organic in the sense that it progresses with the game. In the first three levels the music has a sense of grandeur and adventure; it marks the beginning of the mission. But from the fourth level forward the tone starts getting more sober, serious and dark as we pass through destroyed cities and war posts. I think this is excellent and a clue that makes us realize the attention to detail that Irem gave to everything. Button 1 for shooting and hold for super shot and Button 2 to throw and call back our pod during the game. The directional pad is to move our ship in whatever direction we prefer. Everything is smooth and simple. I’ve been playing this game since 1992, how about that for replay value!! You will play this game several times and after finishing it, how about finding out the secret bonus level in the fourth level? And beating your top score? You will came back to this game that unlike others stays with us, I sing the first level intro several times, it sticks in our heads much like the music’s in AKMW stay. The game is that good!!! !